A comprehensive guide to the law governing prisons with a strong focus on prisoners' rights and remedies.
' ... a book grounded in reality and practicality and aiming to provide a comprehendible yet comprehensive account of prison law as it affects the majority of prisoners.' The Howard Journal. 'This is a magisterial study of the interface between prisons and the law.' Stephen Shaw, Prisons and Probation Ombudsman, from his foreword. Prisoners: law and practice is a comprehensive guide to the law governing prisons with a strong focus on prisoners' rights and remedies. Prisoners: law and practice critically analyses the duties the state has to those in detention and provides thorough coverage of all the relevant domestic and international case-law, legislation, policies and guidance. It is set out in an accessible and practical way. The book follows the path of a prisoner through the custodial process from reception at prison, via the issues of categorisation and allocation, prison conditions and rights while detained, to the various mechanisms for release. The routes for challenging adverse decisions are considered in the context in which they arise, and in addition there is a thorough chapter on the remedies available to prisoners. Relevant law is reproduced in the appendices. 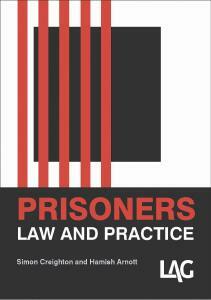 Prisoners: law and practice is essential reading for lawyers, advisers and prisoners and their families. With its focus on the practice as well as the law, this book is also an invaluable guide for all those working within prisons and for the Prison Service and related bodies.